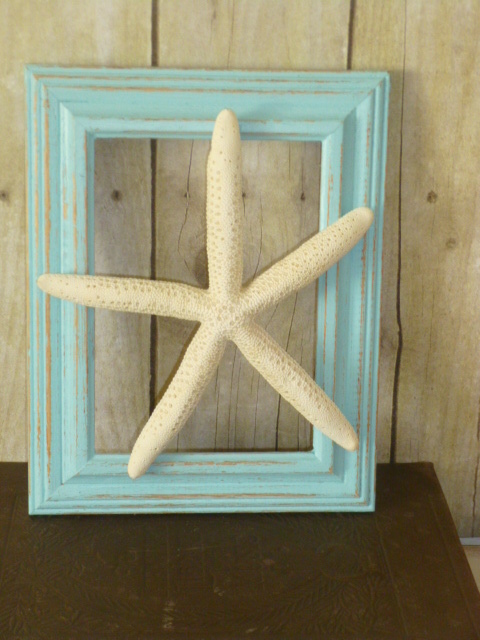 Pair of pretty shell prints in monochromatic color scheme. 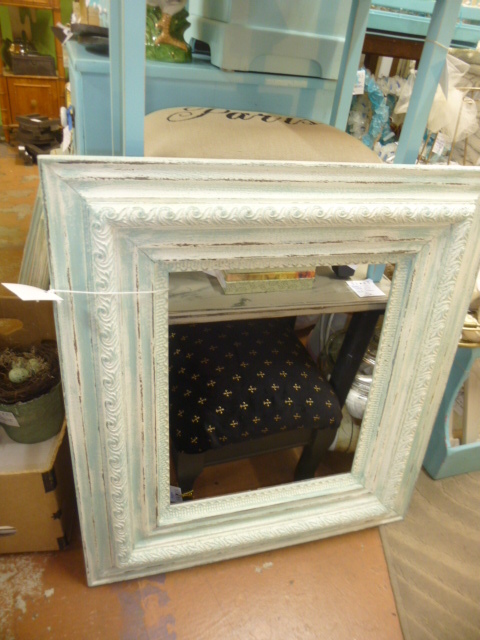 Initially I had looked at these ‘just for the frames’; but the frames were not removable. I really liked the pictures, and usually I’m all about monochrome colors. These were just TOO bland for me. 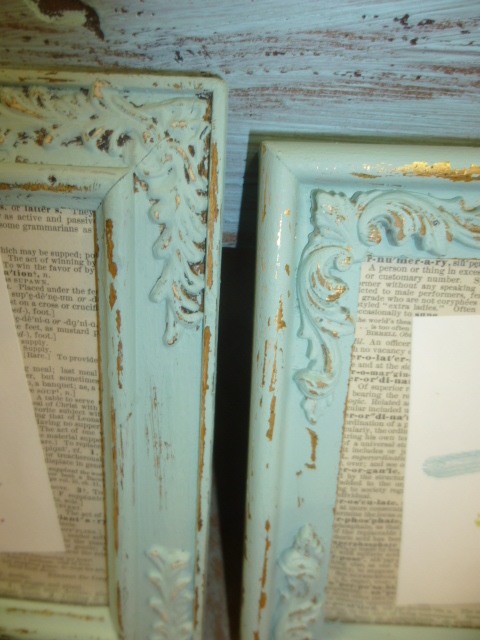 I have always liked this kind of ‘text book’ drawing; so I decided to buy them and see how difficult it would be to repaint the frames with NOT being able to remove them. 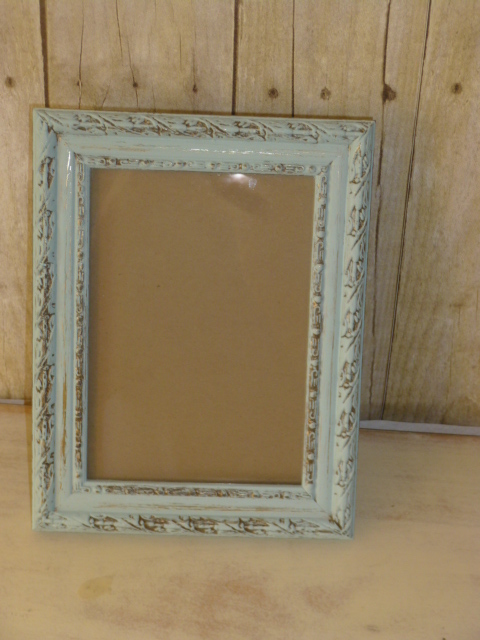 The hardest part of this quick make-over was taping the paper over the glass to protect it while I painted the frames. 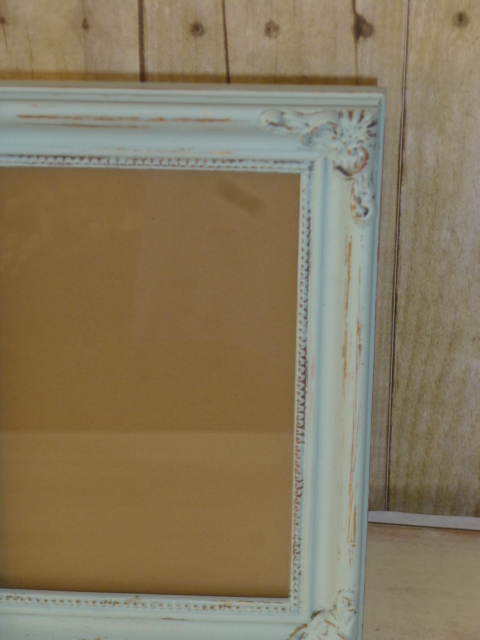 A couple of quick coats of paint; then some sanding (sand BEFORE you removed the paper covering the glass!). 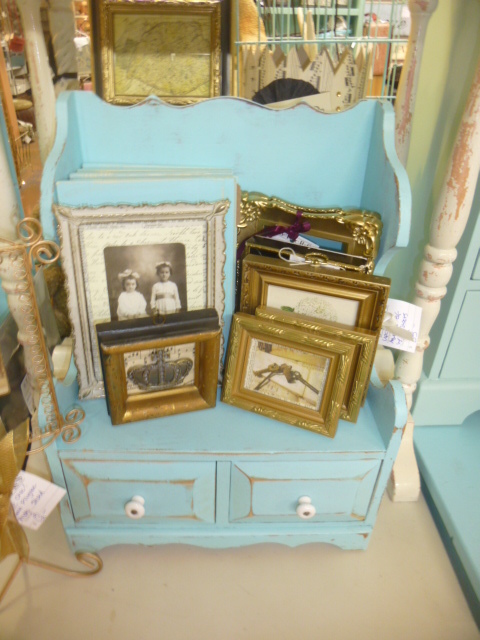 Just a touch of color; the distressing brings out the original frame color to coordinate with the pictures. Which do you like better? Original color or the aqua? 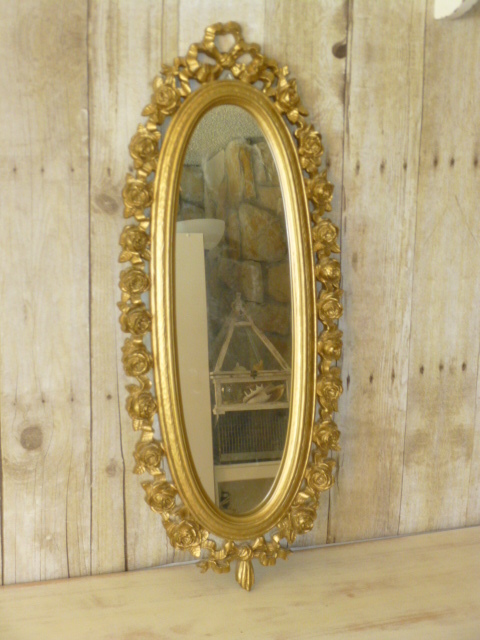 Very cool, taaaaaaaaaaaaaaaaaall skinny wall mirror with roses . . .but the gold??? Good candidate for a shabby make-over! This particular mirror backing was STAPLED in place??? Hmmmmmm. 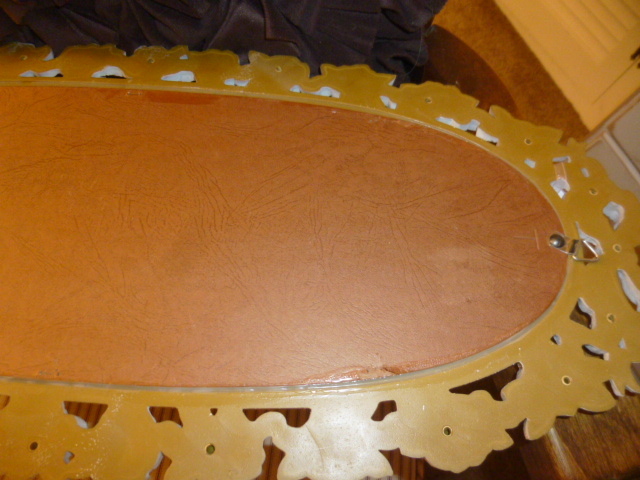 But most of the staples had been previously removed and the mirror was really held in place by the tape shown in the last picture. I decided the rest of the staples should come out easily too. The staples did come out very easily. 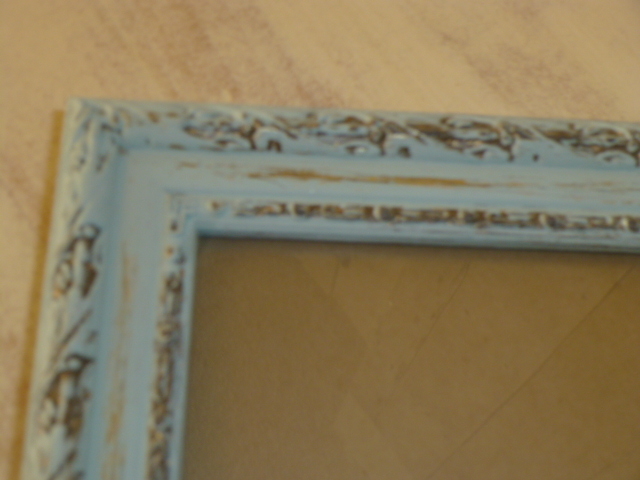 I gave the frame a good cleaning to get all the dust out of all the nooks and crannies. 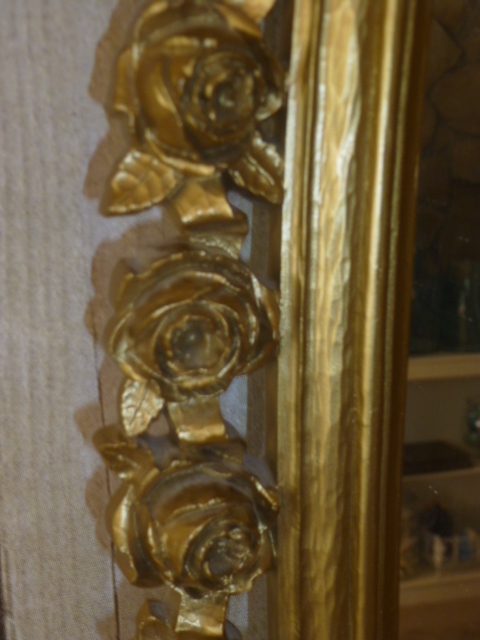 Roses just are not supposed to be GOLD! 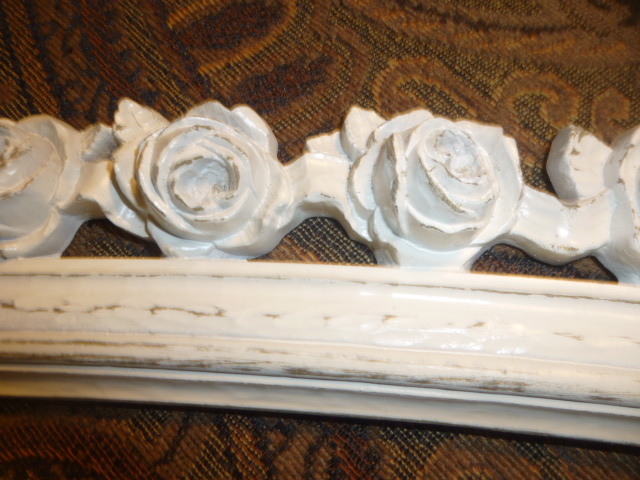 A couple of coats of an off-white spray paint and LOT of hand sanding to bring out all the pretty details. The bow at the top. The tassel at the bottom. And lots and lots of roses to sand, petal by petal. 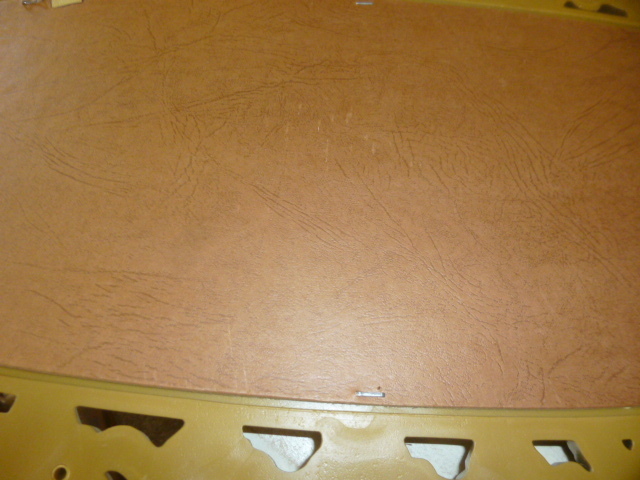 I actually had to do the sanding in three or four sessions and give my hand a rest between! 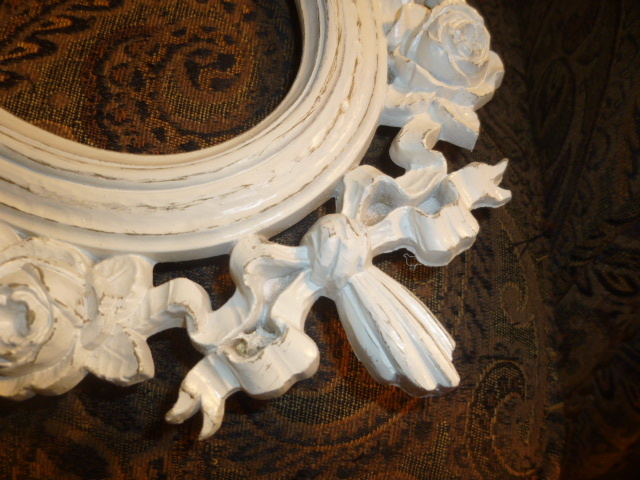 Time to reattach the mirror. I was not brave enough to attempt to staple it back in place, and tape was not reliable enough. 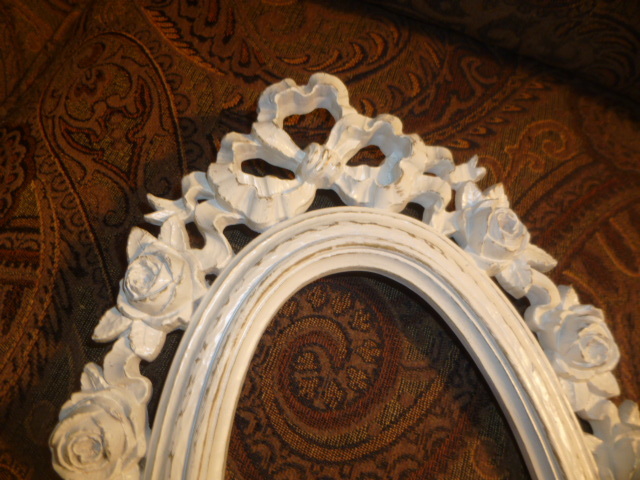 I had to GLUE the mirror back into the frame. 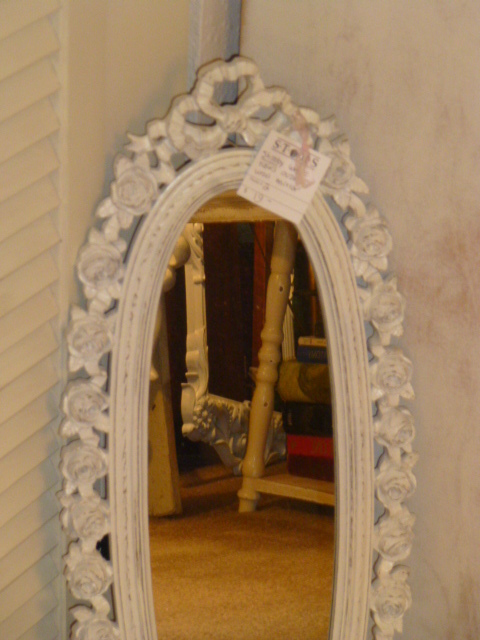 Using my trusty Aleen’s Tacky Glue, I ran glue along the inset and replaced the mirror. 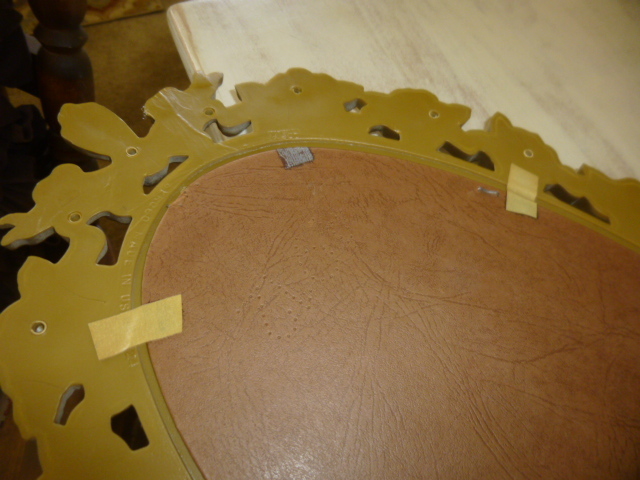 Let that dry overnight, then filled the gap between the backing the the frame with MORE glue. It’s in ‘storage’ for the time being. Might end up saving it for next spring or the first of the new year. Next booth ‘do-over’ will be Halloween stuff . . .then Christmas . . . .then . . . . ALWAYS thinking ahead! 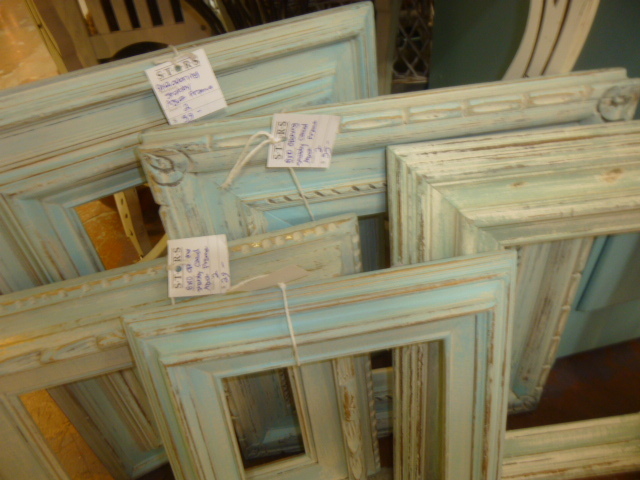 New batch of small frames. 50% OFF sale reminder. 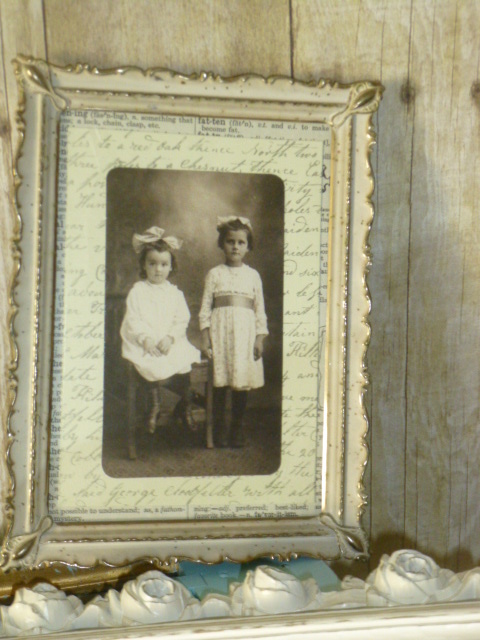 I typically prefer to gather and re-vamp BIG wall size picture frames, but it’s been pretty slim pickin’s on those lately, so I’ve started rummaging through the smaller frames at thrift stores and estate sales of late. 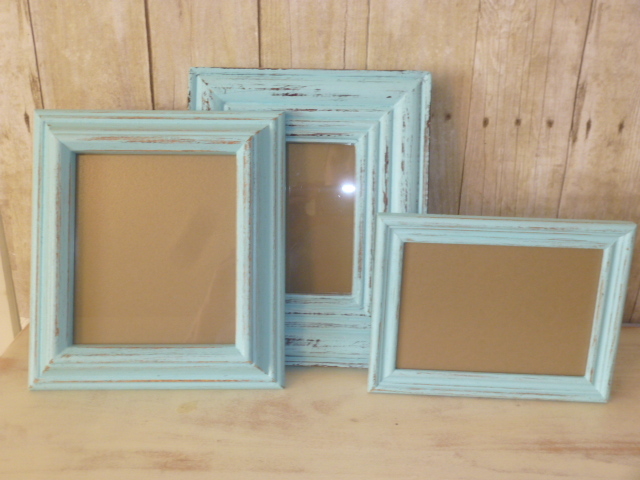 Here are some from my most recent batch of made-over frames. 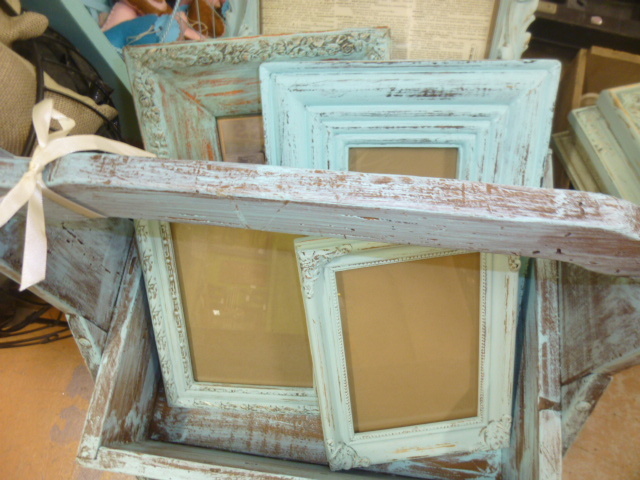 Just aqua paint and some hand sanding on them all. 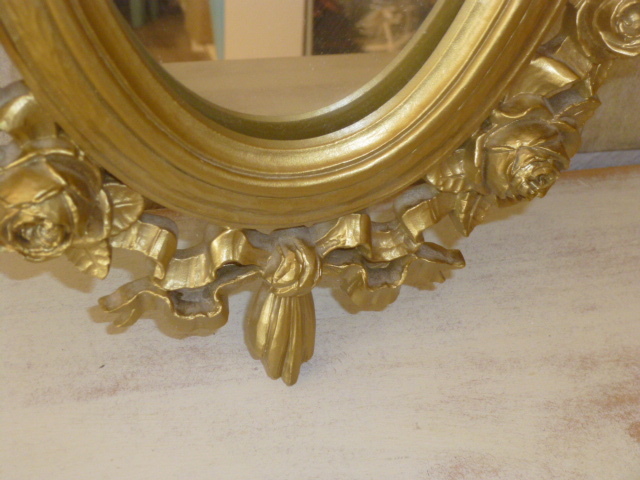 I look for frames with interesting embossed details. Sometimes the details are ‘just’ in the corners. 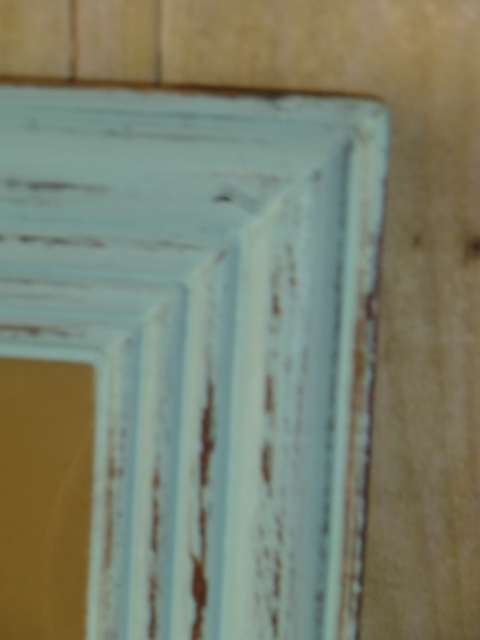 Other times, the whole frame is detailed. 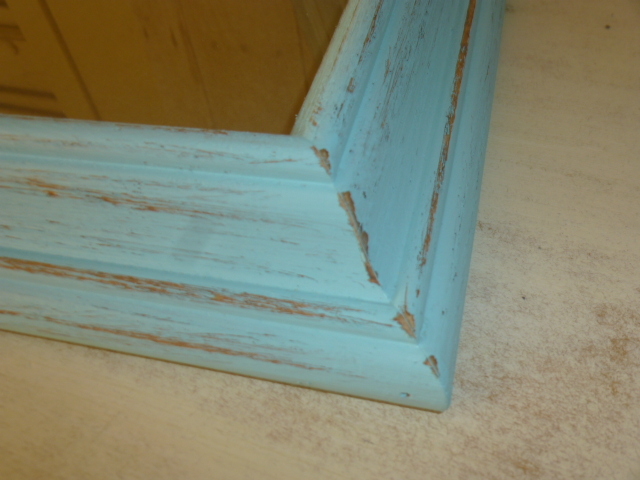 Even just repetitive grooves add a lot of interest once painted and distressed. 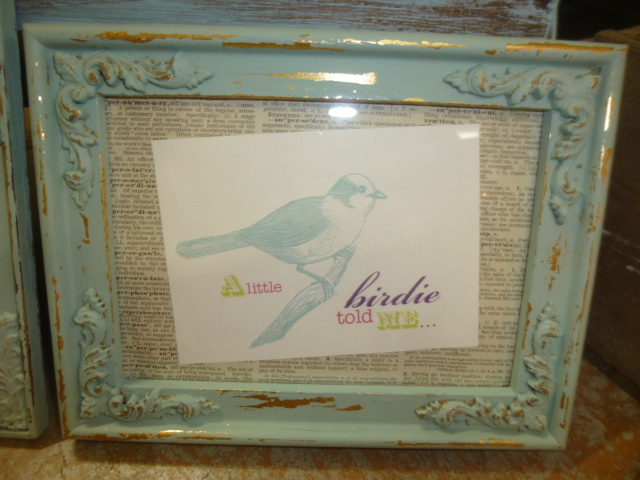 I was in a hurry to get this batch done and into my booth, and decided to forego the ‘pictures’ in most of these frames. It really doesn’t COST much to add some kind of a picture to them, but it is TIME consuming. But I still managed to add a ‘little something’ to a few of them! 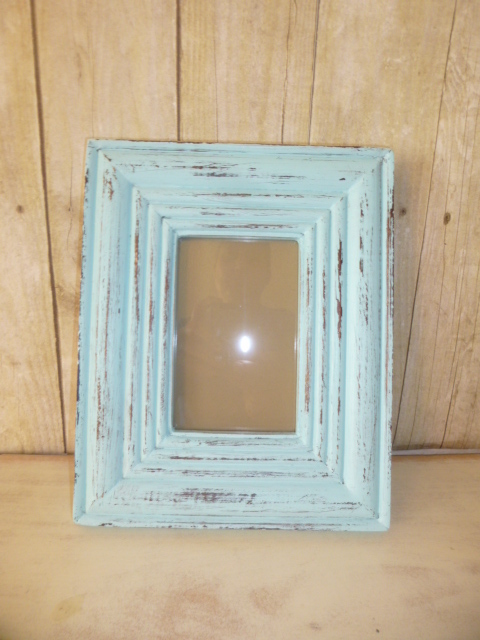 Sometimes I do varying shades of aqua / turquoise when I do a batch of frames. Since each frame was so unique I went with all the same color on all of them this time. Really DEEP frames are always a good find too! Not so fond of how this one turned out. Just might have to repaint it white. We’ll see. 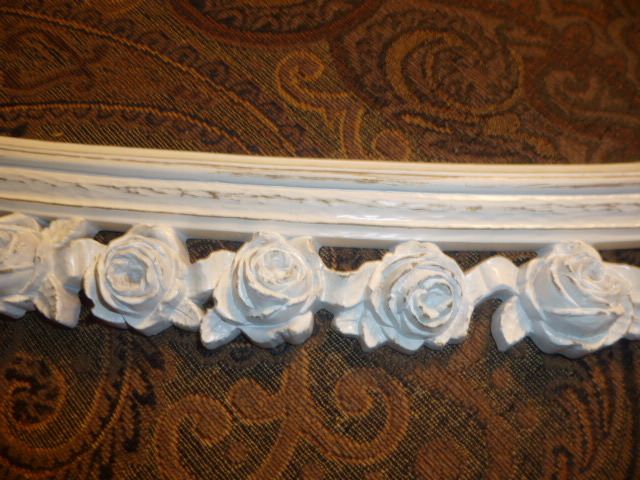 I think I actually liked it BETTER before I repainted it! 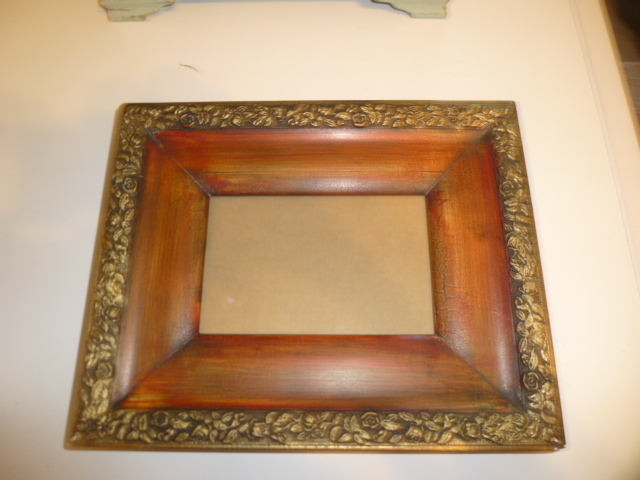 You can’t tell in the picture, but the brown part of the frame has a crackled texture to it; kind of looks like alligator skin. 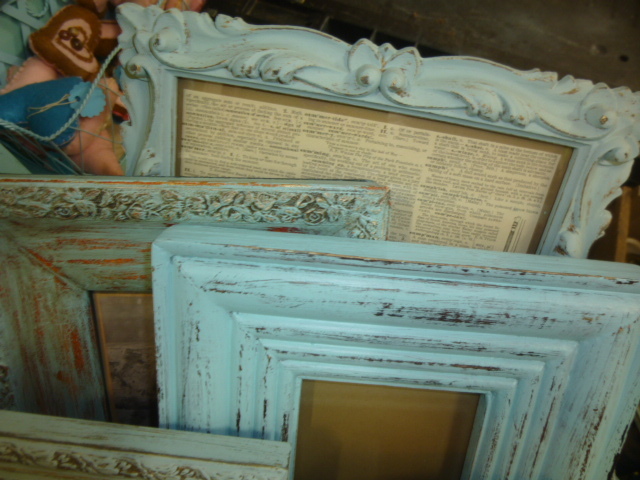 Layers of frames; a study of contrast. 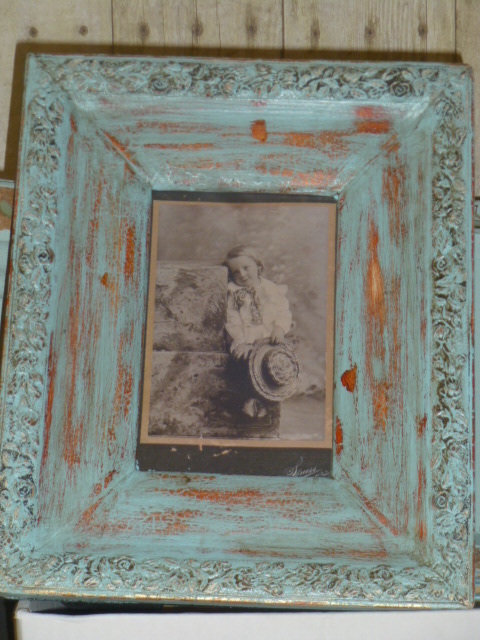 This small and sweet vintage metal frame was perfect ‘as found’; I just added a picture. 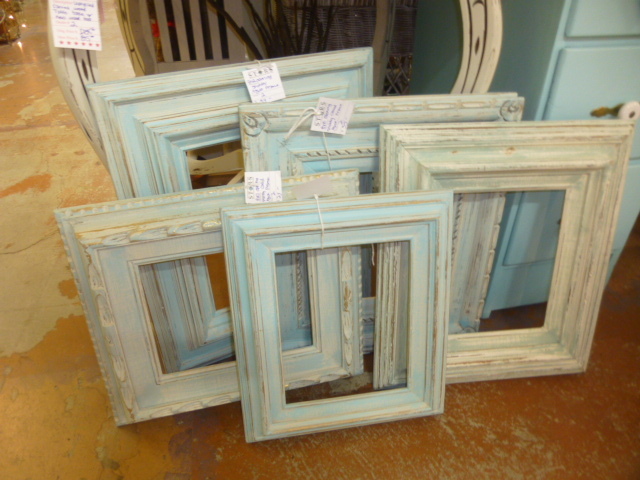 This batch of larger ‘wall frames’ had originally all been repainted white and distressed. Alas, they had been sitting in my booth for TOO long without selling, so I brought them home for another make-over. 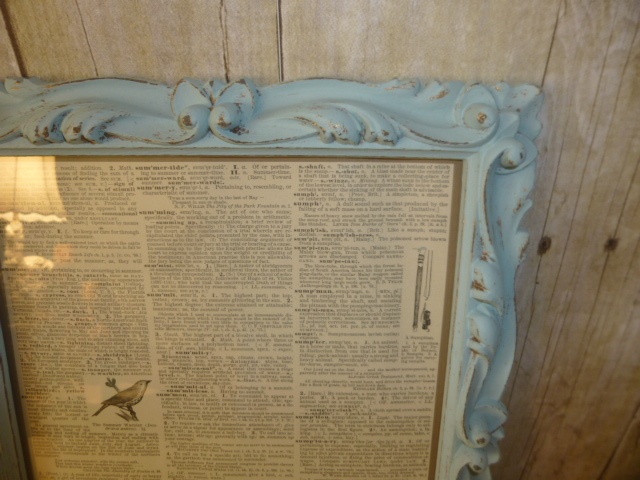 A quick dry brush with aqua or turquoise paint and a bit more sanding. Back in my booth just in time for the HALF PRICE SALE. I SO wish I had more wall space available so that I could actually ‘display’ them instead of just plopping them on the floor. 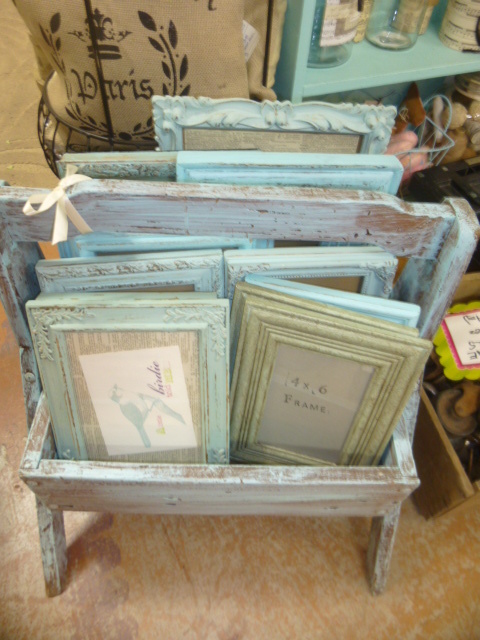 Frames are probably my favorite decorating accessory and they sell so much better when ‘properly displayed’. Although there is another dealer who has one of those big ole canvas cargo carts in her booth and she just piles all her frames into it. 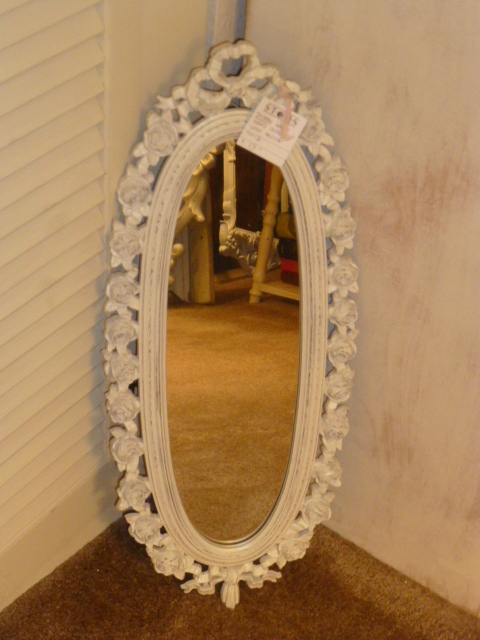 I constantly see shoppers curiously rummaging through them, hunting for a treasure to take home. REMINDER: EVERYTHING IN MY BOOTH IS 50% OFF THROUGH LABOR DAY MONDAY. Sale signs are posted in each booth, (and in all 3 stores!) with varying % off. Perfect way to spend a rainy Labor Day weekend. 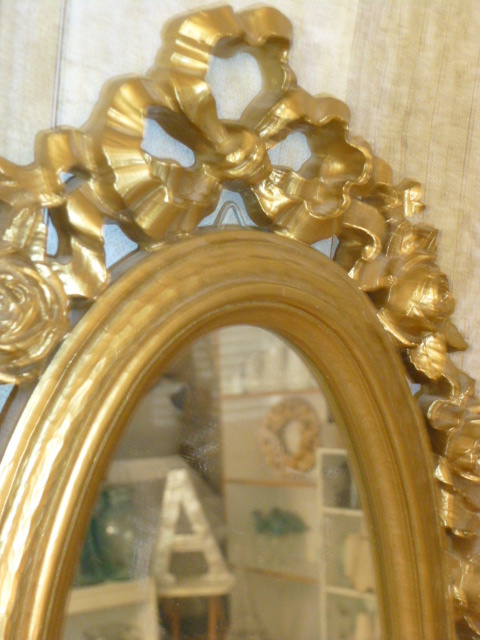 I’ve got lots of vintage little gold frames too!